St. Getulius died in 120 AD and is venerated as a Christian martyr and saint in the Catholic Church. He was considered to have died at Gabii. According to tradition, Getulius was the husband of St. Symphorosa (feast day July 18th). According to legend, Getulius was a native of Gabii in Sabina (an ancient city 11 miles east of Rome). He was an officer in the Roman Army who resigned when he became a Christian. He retired to his estates near Tivoli. An imperial legate was sent to arrest him, but Getulius converted him to Christianity. Another legate was sent, but he too was converted. All of them were tied to a stake and set on fire. However, the fire did not harm them, so they were brutally beaten to death. 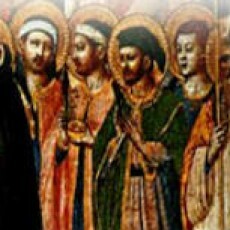 According to the Roman Martyrology, St. Getulius was killed on the Via Salaria, and is called the father of seven martyrs (sons) and the husband of St. Symphorosa. His companions were Caerealis and Primitivus, the imperial legates, and his brother Amantius. They were captured, imprisoned, thrown into the flames, but emerged unharmed and they were beaten to death with clubs. It also says that St. Symphorosa buried them on her estate. They had seven sons, and each of them is named in the Roman Martyrology, each of them suffered a different kind of martyrdom for their faith. Even Getulius’s wife Symphorosa was canonized a saint. A church was built in what is today known as part of Montopoli di Sabina, which originally held his relics. In 867, Abbot Peter of Farfa moved these relics to his Abbey in a solemn ceremony. There was previously a church of San Getulius at Teramo. Pope Stephen II in 752 transferred the relics of his wife St. Symphorosa and their seven sons to the Church of St. Angelo in Pescheria at Rome. In 1584, Pope Gregory XIII donated part of these relics to the Jesuits, which placed some in the Chapel near Villa d’Este, and some when to India and Spain with missionaries. St. Getulius died in 120 AD and is venerated as a Christian martyr and saint in the Catholic Church. He was considered to have died at Gabii. According to tradition, Getulius was the husband of St. Symphorosa (feast day July 18th). According to legend, Getulius was a native of Gabii in Sabina (an ancient city 11 miles east of Rome). He was an officer in the Roman Army who resigned when he became a Christian. He retired to his estates near Tivoli. An imperial legate was sent to arrest him, but Getulius converted him to Christianity. Another legate was sent, but he too was converted. All of them were captured, tied to a stake, and set on fire. However, the fire did not harm them, so they were brutally beaten and beheaded. His wife and his seven sons were also all martyred for the faith, making everyone in his family a saint venerated by the Church.